Even a very normal day is a disaster with Mr. Clumsy. The only place he's safe is asleep in bed! 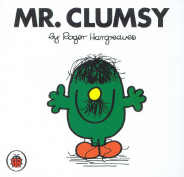 Hargreaves' story of Mr Clumsy is a catalogue of endless disaster! Everything Mr Clumsy touches, breaks or ends up where it shouldn't. Everywhere he goes, chaos erupts.